Photo by M Photography Look at that smile! As of Saturday, September 29th, Pop Culture Baby 2 (AKA Brennan) is a baby no more. 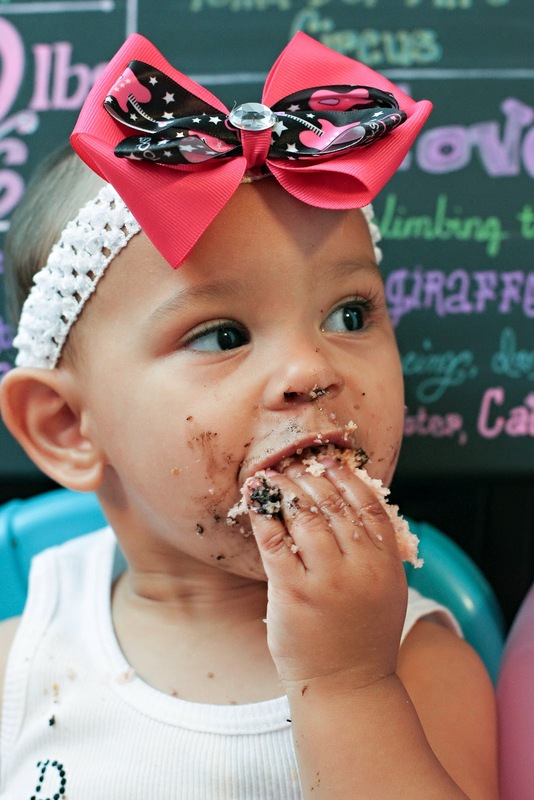 My little princess is now one. I started party planning mode months in advance. At first, I was set on doing a Lil' Angels theme after finding some of the decorations on clearance at Party City. I polled my gal pals about it. Most thought it was cute, but one thought skulls were a little morbid for a baby's birthday party. Although I disagree, I could see how some of my family members would have also had that viewpoint. Besides, after looking at and Pinning some of the Lil' Angel decorations to my Pinterest board for kids' birthday ideas, another idea was forming in my head. 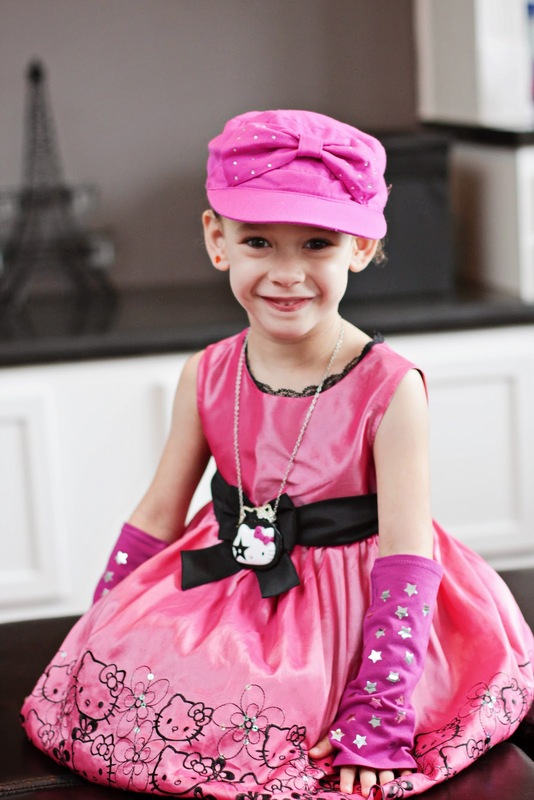 PCT2 is such a little rock star. 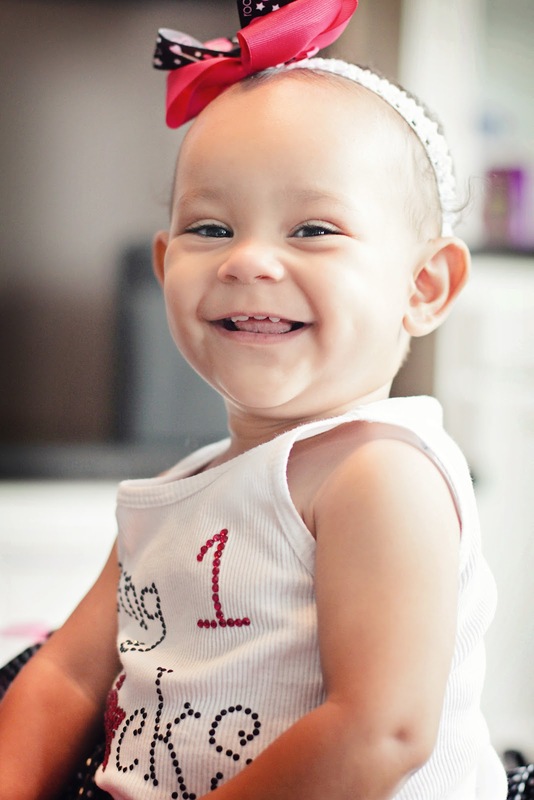 Early on, my friends gave her the nickname Super Baby. She was so ahead of everything, and so happy while doing it. She is honestly as close to perfect as a kid can come (minus her lack of sense of self-preservation). A rock star birthday seemed just too perfect for her. 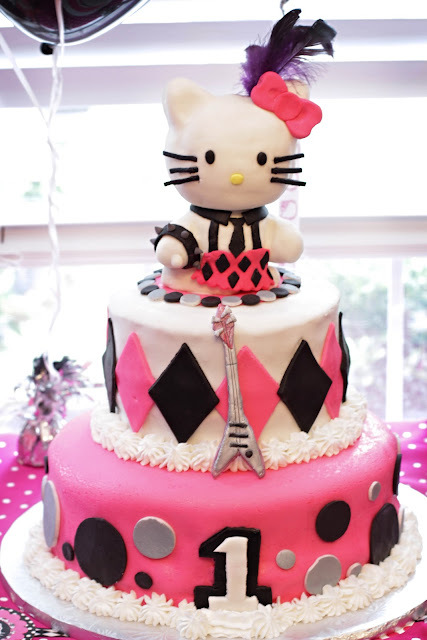 And, well, since we are practically the house that Sanrio built, a Hello Kitty rock star theme seemed perfect. I got to websurfing and Pinning. I found a lot of great ideas online, but wasn't sure how I was going to pull them off. That led me to starting the decorations two months before PCT2's birthday, so I would have ample time to start over if I messed up. The first thing I did were the invitations. I found some pink and black argyle images/digital scrapbook paper on Etsy. 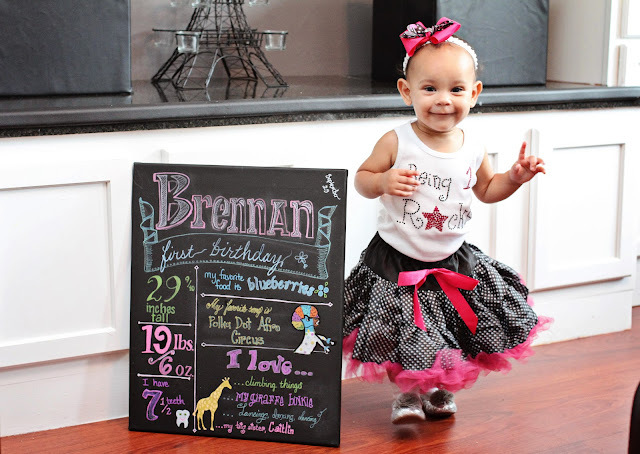 As I blogged about previously, I designed the invitations with an app on my iPad. I bought some 5x7 invitation paper to print them out (with gorgeous hot pink envelopes to match). When I had trouble getting the print settings perfect (going from iPad to PC), I got some help from one of my mommy board pals, Sweets4ever at Craftster. The invitations were my starting point for the rest of the decorations. 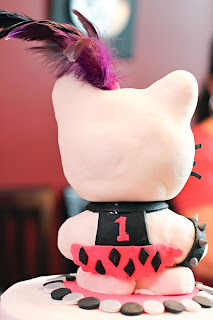 I found some a Hello Kitty buttons on Etsy also. While they never printed properly as 1" buttons, they did provide me with great backdrops for my other decorations. 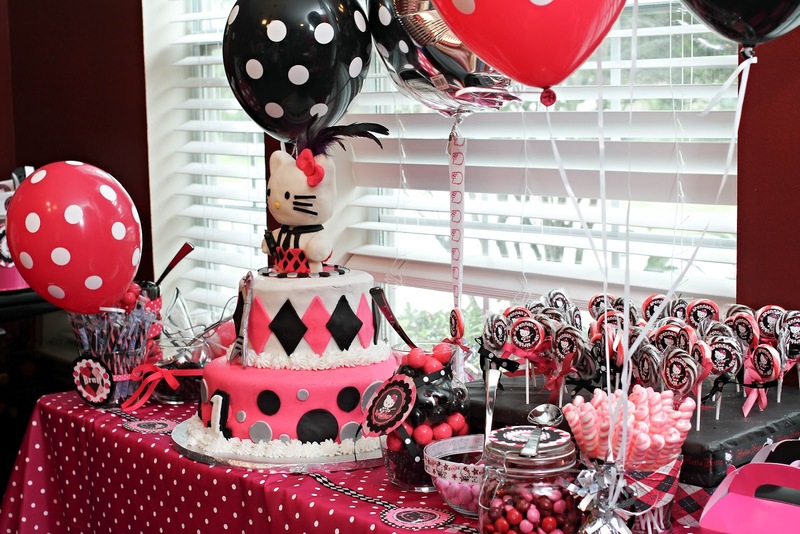 One of my favorite Hello Kitty rock star designs (the same one on the invite) served as the base for the lollipop decorations, some of the hanging decorations, the wall posters and the favor boxes. 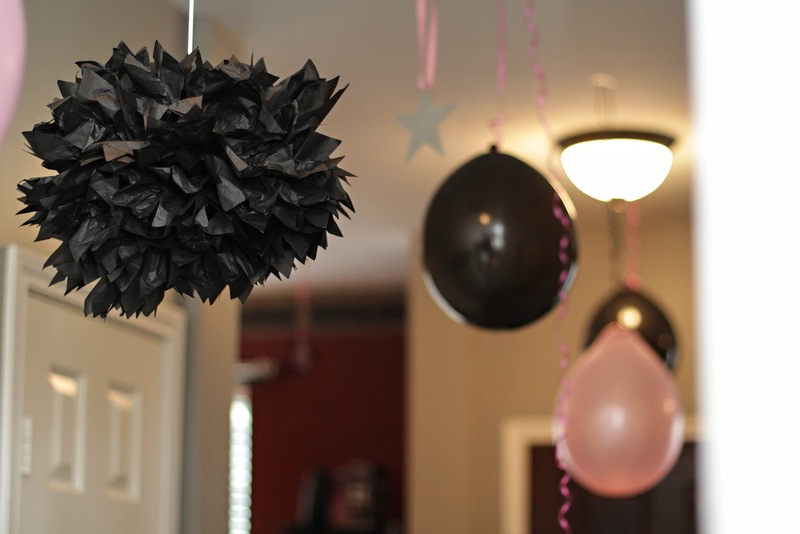 The second long-term design project were the aforementioned hanging decorations. Initially I thought about buying those Lil' Angel hangers in the clearance bin and pasting Hello Kitty over the skulls. I figured out, however, I could do it on my own. I got circular and scalloped punches in varying sizes. 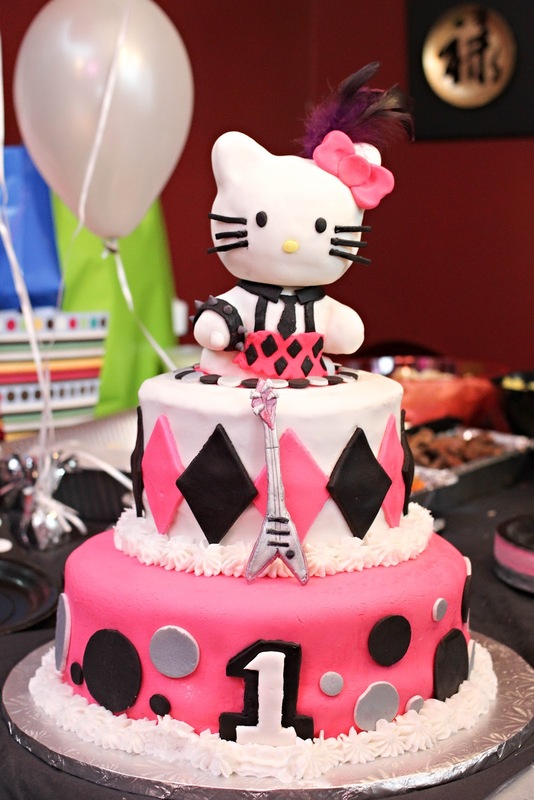 At night when everyone was asleep (I work, after all), I would sit up in bed punching out the Hello Kitty's and various plain black circles with either PCT2's name or a "1" on them and plain circles or scallops on either the argyle pattern, black, or silver sparkles. Once a had a quart-size Ziplock bag completely full of punched-out paper, I started matching various shapes, sizes and designs until I was happy. I then bough decorating ribbon in black, pink and silver, and spent my nights gluing and taping my designs. 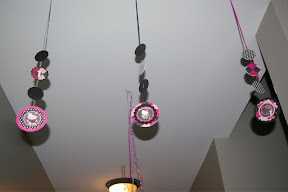 The result were hanging ribbon decorations with three circles on each. I saved the remaining paper cut outs for other decorations. I also bought several balloons to hang. We are in the process of selling our house, so the last thing I wanted to do is have tape and push puns everywhere. 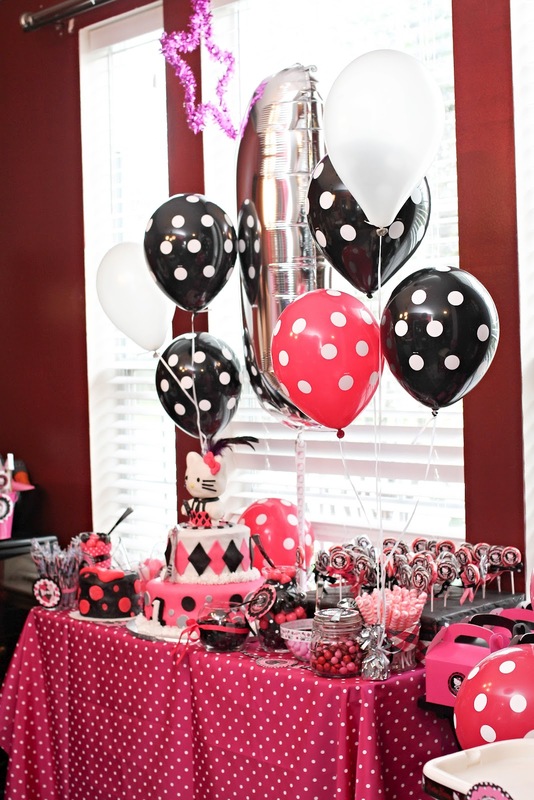 However, thanks to the helium shortage, my vision of floating balloon everywhere had to be curtailed. I did manage to procure two tanks, one of which was used almost exclusively on three gigantic mylar balloons shaped like the number one. I also made signs for the walls, door and window using the Avery Removable Wall and Window Signs. Some of the reviews regarding the actual removability of the stickers were not favorable, and with freshly-painted walls, I was not willing to take a huge chance. If I had to do things over, I would skip these. I was desperate to do a candy bar. 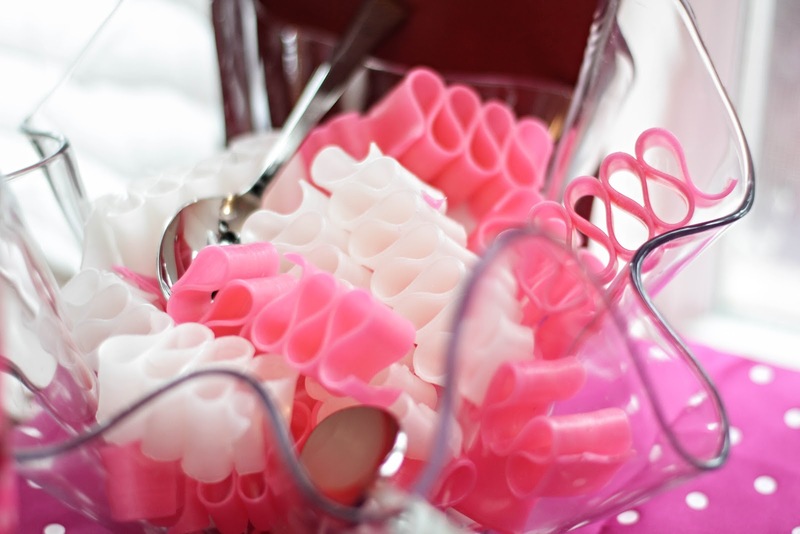 I always love seeing them at parties, and there were some very cool-looking ideas on Pinterest. However, I didn't want to spend three-figures making one. 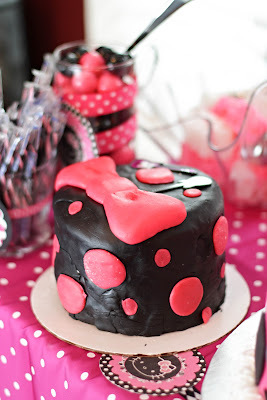 I bought some satin pink polka dot fabric on eBay to use as a table cloth and jars from the dollar store. 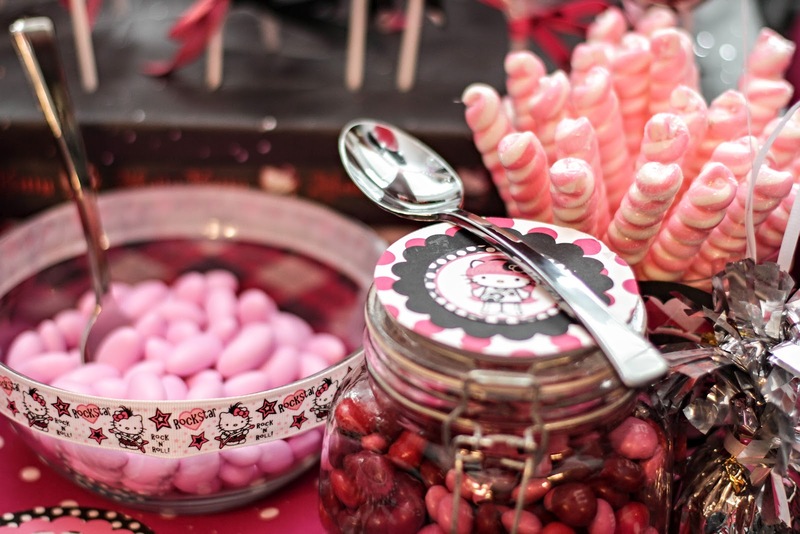 I found pink and black candies on Amazon.com and from various candy wholesalers online. 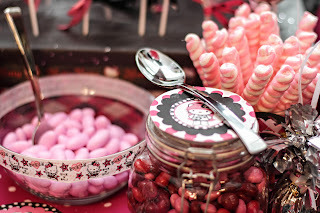 I also found some raspberry M&Ms in varying shades of dark pink and licorice bites from my local Super Target. 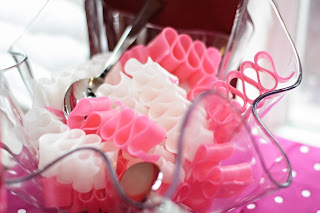 I decorated the glass jars with ribbons I bought from Michael's and the punched-out designs I had made previously. 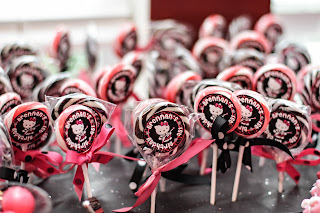 For the lollipops, I got some flower decorating foam boards and wrapped them in black tissue paper, putting ribbons around one layer and pink and black argyle duct tape around the other. 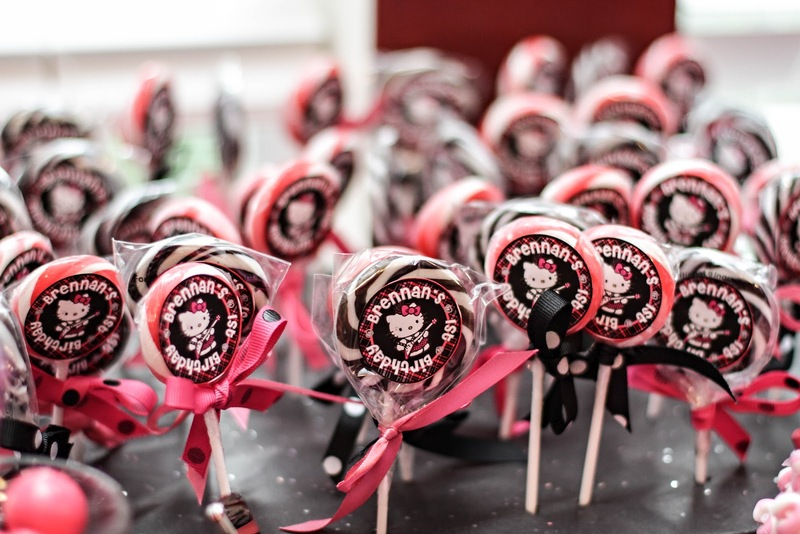 The personalized stickers on the lollipops were created on Microsoft Word with Avery 1" round labels. 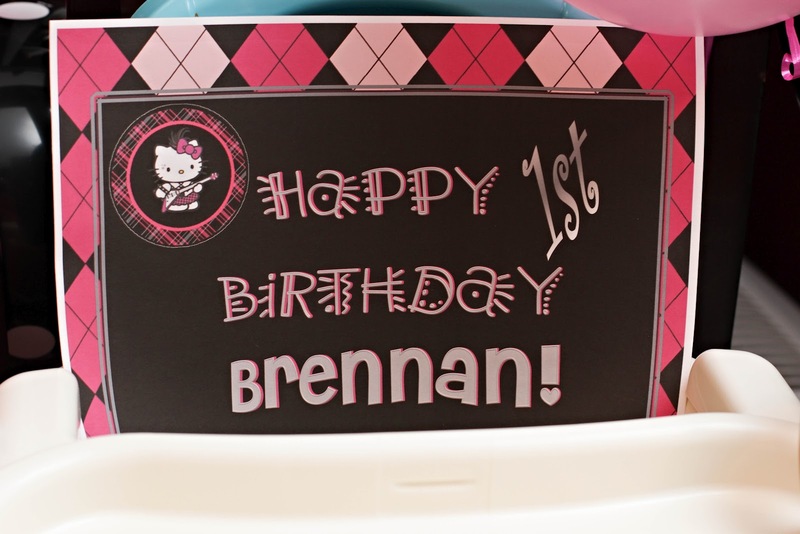 I took my favorite Hello Kitty button design and used Word to personalize the circle around her. We will reuse the jars and the fabric. I can't sew to save my life, but my mother is very good at it and plans to make the girls dresses with the fabric. I found cheap hot pink and black boxes on Amazon and used the same Hello Kitty design, but on the 2" Avery stickers to decorate the favor boxes. The favor boxes were all empty for the kids to fill up with cookies (see below) and candy from the candy bar. 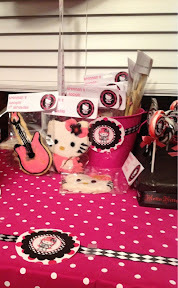 I bought some Hello Kitty cookie cutters from Sanrio.com and a guitar cookie cutter from Amazon. 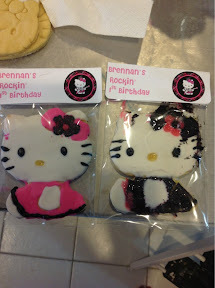 I already had the star [honestly, I can't believe we didn't have a Hello Kitty cookie cutter before now!]. I baked several dozen cookies and frosted them all. For the packaging, I got Avery Printable Bag Toppers, which also came with the plastic bags. 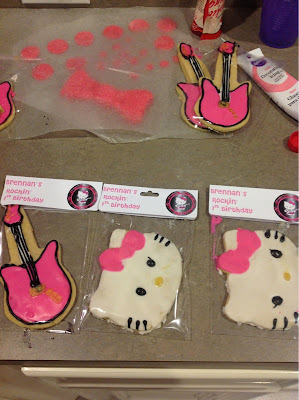 They perfectly fit all of my oversized cookies, except for a couple of the guitars, which had spread when baked. Most of those broke in half as I was trying to get them into the bags, anyway, so it all worked out. I also had some trouble with the black cookie frosting refusing to harden, but over all, the cookies weren't bad. My mom assumed I had bought them somewhere, so I take that as a compliment. Some Kitties clearly fared better than others! Thank you, Pinterest! I made the water bottles by removing the existing labels from water bottles and putting pink and black argyle duct tape where the labels used to be. 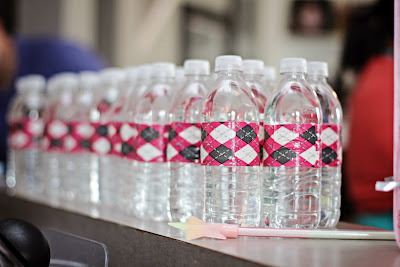 They matched the party beautifully, and unlike paper labels you make yourself, these could go in a cooler without being destroyed. My smash cake did not go as well, though. No matter. Its purpose was to be demolished! 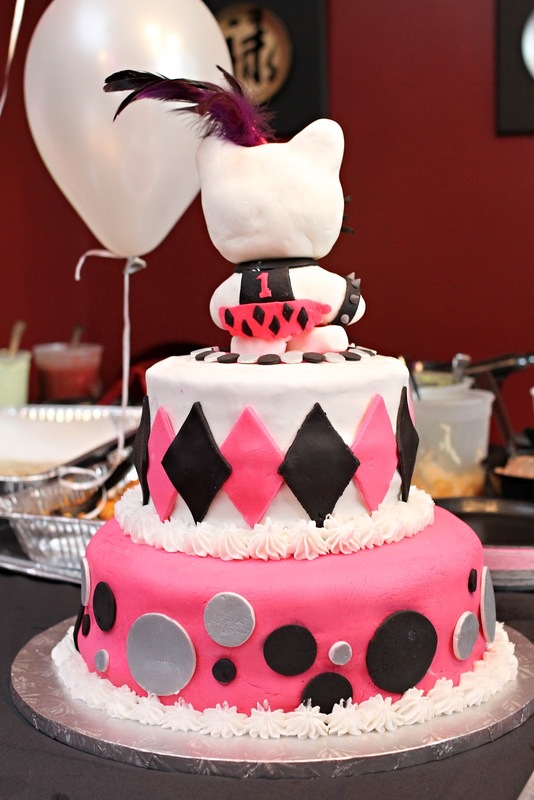 I am proud of myself for figuring out how to (kind of) use fondant, though. And PCT2 sure didn't seem to mind! 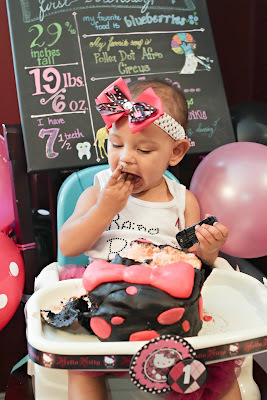 This is one of my proudest Pinterest-inspired creations. I spent weeks playing around with fonts on my computer and drawing things out on my iPad and by hand until I was satisfied with how the board would look. 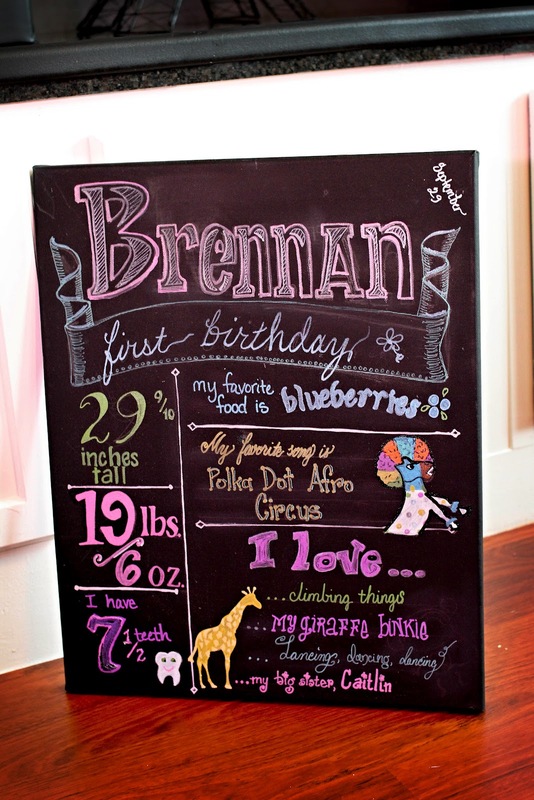 Initially I wanted to do a chalkboard with chalk markers, but I couldn't find a board with a frame I liked. So I settled instead on a black canvas with paint markers. Some of my numbers proved wrong at the well-baby checkup the next day (she's actually 30.25" long and 19 lbs 12 oz), but it still looks good. Special thanks to my friend Mirna at M Photography for taking pictures. Mirna does all of our family pictures, and she totally rocks! If anyone is in the Houston area, I highly recommend you give her a call! Pop Culture Preschooler ready to rock out. Note: any picture that doesn't say "Photo by M Photography" under it was taken with my iPad (that's why the quality isn't as good).